All rates are based on our Catch&Release Program. You may still keep fish while on the program. Add one or more discounted boat rates to either a cottage, houseboat or room. Boat rentals do not include gas. MN Sales tax 6.875 %, County Tax .5% and Local tax 3% not included in rates. Experience your unique cottage floating on the water. At night fall asleep to the gentle rocking of the boat, wake up the next morning to the sound of ducks and the call of the loon. An elegant modern design, luxurious with custom kitchen cabinets and large windows all around. 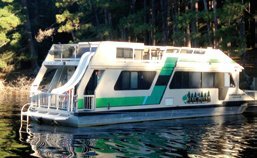 Our 46’ houseboat has two double bed staterooms, a spacious living room with sofa sleeper, galley equipped with a full size stove, refrigerator/freezer, microwave, toaster, Bunn coffee maker, all cook and dishware. The boat is ideally located on the north end of our peninsula which provides picturesque views from every room from an upper deck breakfast to a sunset dinner. Private, yet accessible to the marina and in close proximity to the main lodge. Complete with a water slide from the upper deck into the water and excellent fishing right off the back of the boat. Central heating/air in all rooms. DVD player, sound system. Full bathroom with shower/sink, toilet. Outdoor gas grill. Sleeps 6. New 1775 Lund Impact SS: 115 hp 4-stroke motor, Humminbird model 859 depth finder with GPS, 55# thrust Minnkota Terrova electric bow mount trolling motor, 8’ in floor rod storage, rear casting platform, front and rear live well/bait wells, on board charging system, landing nets, comfortable seating for 4, running lights, 27 gallon fuel tank, a 94” beam width, includes life vests, anchor, landing net and front bike seat. All Deluxe boats are equipped with Mercury 4-stroke EFI motors, Humminbird 859 depth finder with GPS, 55# thrust bow mount trolling motor, comfortable pedestal seats - for up to 3, life vests, running lights, live well, on board charging system, bait well, 8’ center rod locker, landing net, anchor, extensive bow storage, 80” beam, 12 gallon gas tank. New 25’ TMC pontoon fishing boats: Choose from 150 hp or 115 hp Mercury Optimax, Humminbird 859 depth finder with GPS, 80# thrust Minnkota Terrova bow mount trolling motor, running lights, live well, on board charging system, includes life vests, landing net, anchor, rod holders, pedestal seats, lounge seating, canopy top. Carrying capacity 2900 lbs or 16 people, 29 gallon gas tank. Special 2: Take 10% off lodging reservations staying after August 13, 2017. Special 3: ATTENTION SENIORS & MILITARY: Seniors 62 and older along with Active & Retired Military take 20% off lodging and boat rentals when reserved together during the month of August. Special 4: ATTENTION SCOUTS: Boy & Girl Scout Troops take 20% off lodging and boat rentals when reserved together during our entire season. Special 5: Book before December 1st for next year’s reservation, and use the current year rates. One Vacation Special per reservation, not valid with any other specials or offers. Well behaved pets are allowed. There is a $50 cleaning deposit per pet. Out of respect for other guests, pets must be kept on a leash at all times, and not left unattended outside, inside the cottage, or in a kennel. To avoid a misunderstanding, you will be charged for the number of nights and/or equipment you reserve. At the time of making a reservation, a 50% deposit is required. The deposit may be made in two 25% installments. Full payment of your reservation is due 30 days prior to your arrival. Our receipt of your deposit guarantees that your lodging and/or boat and motor rentals are reserved for you. In the event of a cancellation, deposits are refunded, less a $50 cancellation fee, only if we are successful in re-booking your reservation.